I figured for being half way through the week we could use a pick me up, so I made you some Chocolate Covered Almonds! Let me tell you the story behind these nuts! About 5 years ago, Trader Joe’s used to carry Chocolate Covered Almonds. My Husband loved them! Then one day as he was looking for his nuts (lol) he couldn’t find them. I searched everywhere for years for milk chocolate covered almonds. No such luck. For some reason they are hard to find. I can find dark chocolate covered almonds, but my Husband doesn’t like dark chocolate so the search was still on for milk chocolate covered almonds. I gave up and said screw it, I’ll make them myself and here I present to you today my Husbands nuts! I couldn’t be more pleased with them. I have to admit I did I pretty darn good job in making them. They tasted the same, if not better than store-bought. 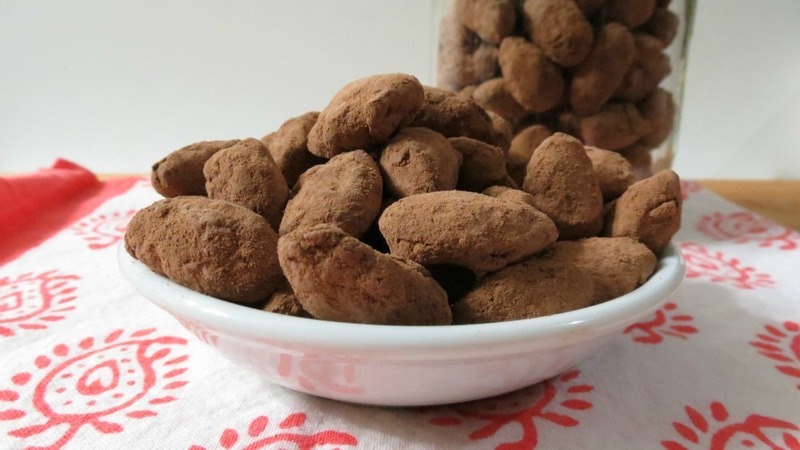 The recipe is soooooooooo easy and only takes three ingredients, chocolate, cocoa powder and almonds. Since it was Trader Joe’s that he loved so much, I used my handy-dandy Trader Joe’s ingredients. By the way for chocolate, I truly found Trader Joe’s Pounder Bars melt like a dream in the microwave. I tried other chocolate and they never turn out in the microwave! First thing I did was roast the almonds for 15 minutes at 300 degrees. You always know when your nuts are done when you can smell them, and boy do they smell good. Than I melted my chocolate in the microwave for 30 second intervals. It only took a minute. I added my roasted almonds to my chocolate, gave them a mix and I have this beautiful mess!! 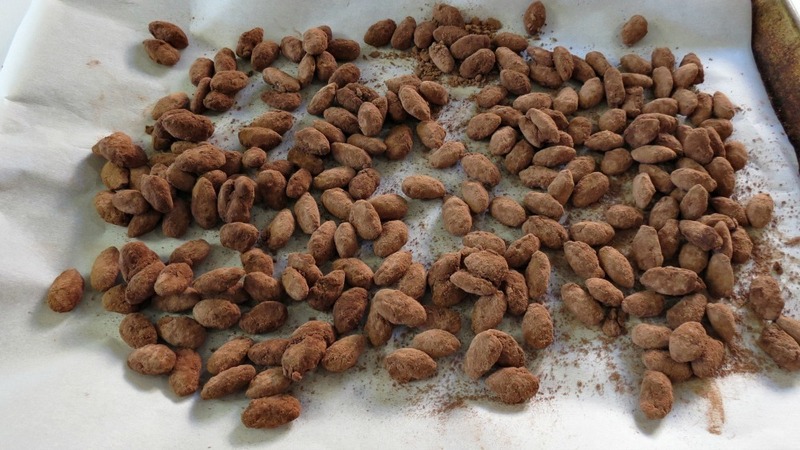 Once the almonds were all coated, I took about a handful of almonds at a time and put them in the unsweetened cocoa powder. Gave them a shake and then picked them up with my hands and kind of bounced them back and forth from hand to hand to shake off the excess powder. Kind of like juggling. I would have shown you a picture at this point, but my hands were covered in delicious chocolate. But here is a picture of them drying on the baking sheet. Once they air dry for about an hour or so, they are all set to eat and enjoy. I stored my almonds in a mason jar and a baggie for easy grabbing. You can store these for up to one month in a sealed container in the cupboard or my guess you can freeze them if they pass the one month mark, however I doubt they will last that long. I was so glad when I came home from work, since I was a pretty good girl eating a fat salad for lunch and fruit for breakfast, I was craving sweet, so I grabbed a few almonds to get me through to dinner. Perfect little afternoon snack. I do prefer dark chocolate over milk, but I’m not to picky when it comes to chocolate!! 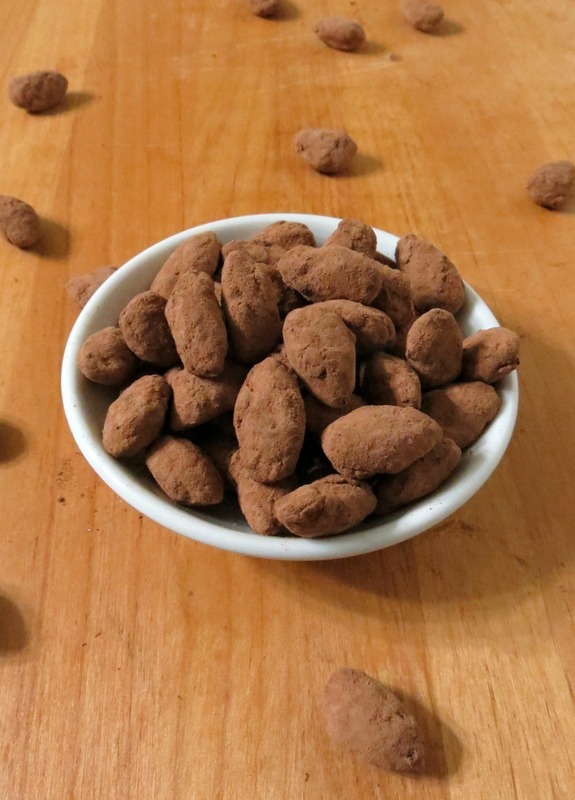 Roasted almonds covered in milk chocolate and coated with cocoa powder. Line a baking sheet with parchment paper and roast the almonds for 15 minutes, flipping half way through. In a microwave safe bowl, add chocolate and microwave in 30 second intervals, stirring in between until chocolate is melted, it took me one minute. Be careful not to burn the chocolate. You could also melt the chocolate in a double boiler, by adding a little water to a pot and adding a glass bowl to the top of the pot, make sure it doesn't touch the water. Melt chocolate, stirring constantly. Add almonds into melted chocolate and mix until all the almonds are coated in chocolate. 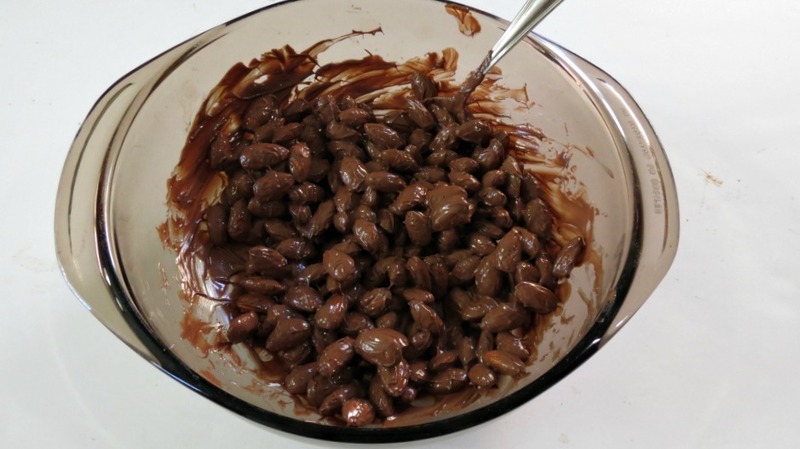 In a medium bowl add cocoa powder; add a handful of the chocolate covered almonds at a time; mix until all of the almonds are covered in cocoa powder. 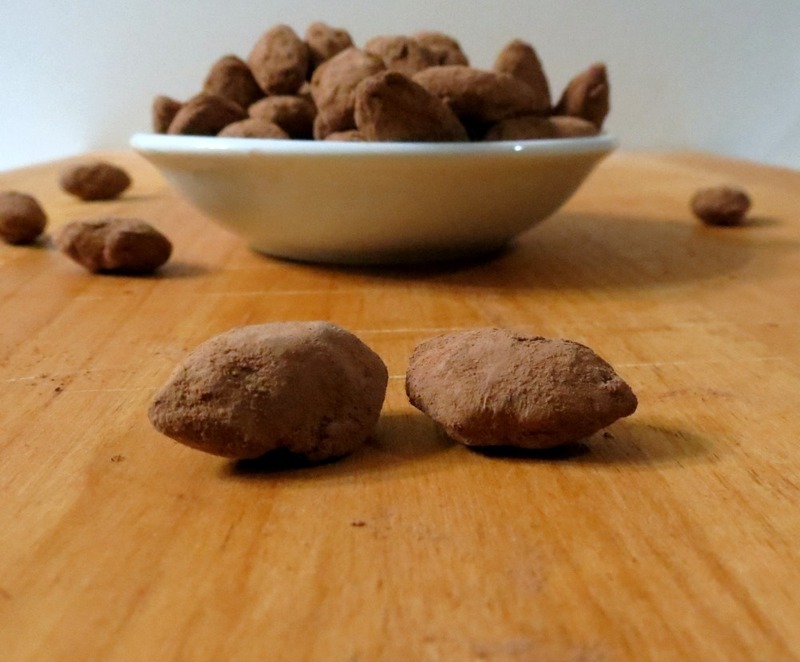 Shake off the excess cocoa powder. I did this by picking up the almonds and bouncing it from my one hand to the other, then placing back onto parchment paper. Do the same to remaining almonds. Please note: do not cover all of the almonds with the cocoa powder at the same time, or you will end up with a big chocolate mess (Trust me!!). Let the almonds air dry. 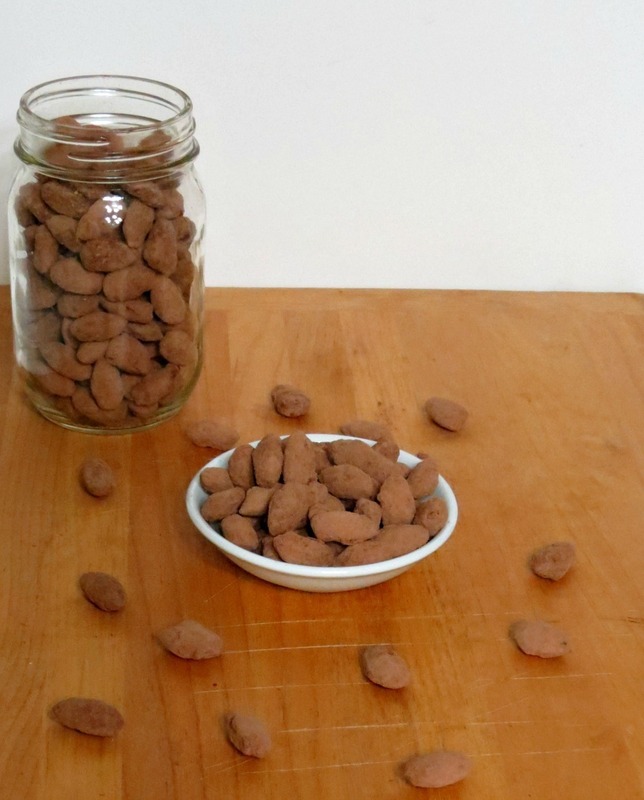 Store the chocolate covered almonds in a seal tight container at room temperature for up to a month. Oh my gosh! Almonds with cinnamon, are my favorite! I LOVE them!! Now I want to make them!! OK, not kidding, there is NO WAY I could have these around my house! I have bought similar items before and they disappeared way too quickly, haha! BUT, these look awesome! They would be fabulous as a little gift! Trust me they are hard to keep around, especially since I made them for my Husband and I keep eating them!! I have no self control! Almonds are my favorite nut too with honey roasted peanuts coming in second! What a great recipe! So easy and yet most of us probably had not thought of doing it. Healthier too. I know that most of the pre-made ones are full of preservatives. I am craving Chocolate nuts. BTW the pun was too funny! Thanks Christi! Your right about pre-made ones. This is so easy and cheaper too, not to mention the smell of roasting nuts in the oven, oh man does it smell good!! I am an equal opportunist when it comes to chocolate and these look awesome! The perfect way to curb your sweet tooth and get some healthy omega 3’s into your life! I have to agree I am an equal opportunist when it comes to chocolate! I try to stick to dark because it’s better for me, but I have never been known to turn down, milk! These look like my perfect snack, Jennifer! I am not a big sweet eater but I do love a chocolate covered nut, especially almonds. I’m not the biggest sweet eater myself, but I do love chocolate covered nuts! They are so addicting! haaaaa! Love the nut jokes. I can only find milk chocolate covered almonds around Christmas time (and then they’re about $16 a pound. ridiculous!) these look just as tasty and much more affordable. I think these are better than store bought and cheaper too! Plus you can have them all year round. It’s weird that they are hard to find. Wow, who would have thought these could be so easy? They sound wonderful and thanks for the tip about the Trader Joe’s chocolate too. I’ll be trying that! Oh Chris, if you haven’t tried TJ’s chocolate, you will love it! I think it’s the best around!! I would eat the whole flippin’ jar!!! lol, believe me I have eaten my fair share! Me too! They are highly addicting!! 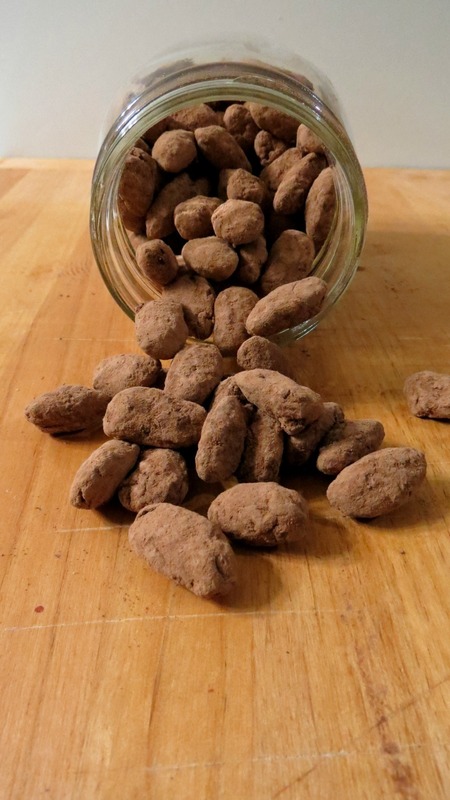 homemade chocolate covered almonds – i love this! I see you shop at my favorite store too. 🙂 I love Trader Joes! Yuppers, I love that darn Trader Joe’s! Where I live, it’s the highlight of our town!! Beautiful! What a GREAT idea to make your own! I have made chocolate covered almonds 4 times in the last 4 days. 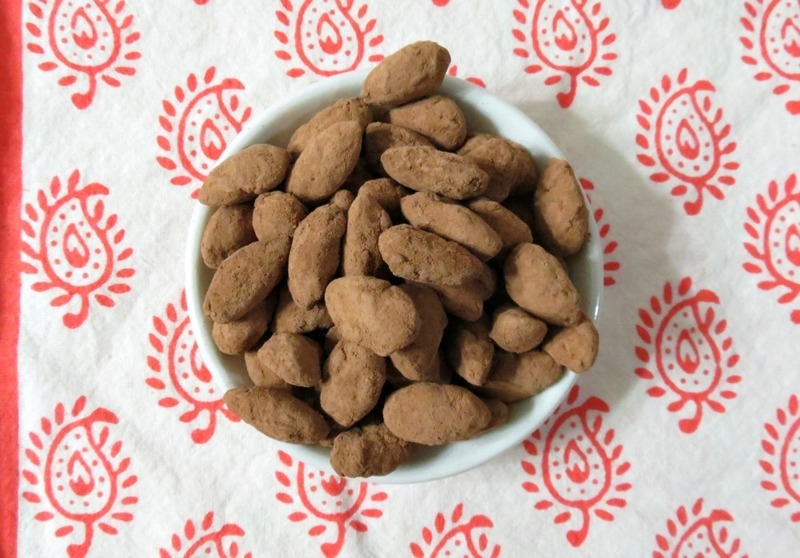 My husband likes cocoa dusted almonds so I started searching for a recipe that would be healthier and cheaper than what WalMart has to offer. I made your recipe today & loved it! I used raw mixed nuts I had leftover from Christmas. Thank you for the wonderful recipe, my children enjoyed these for dessert after lunch. 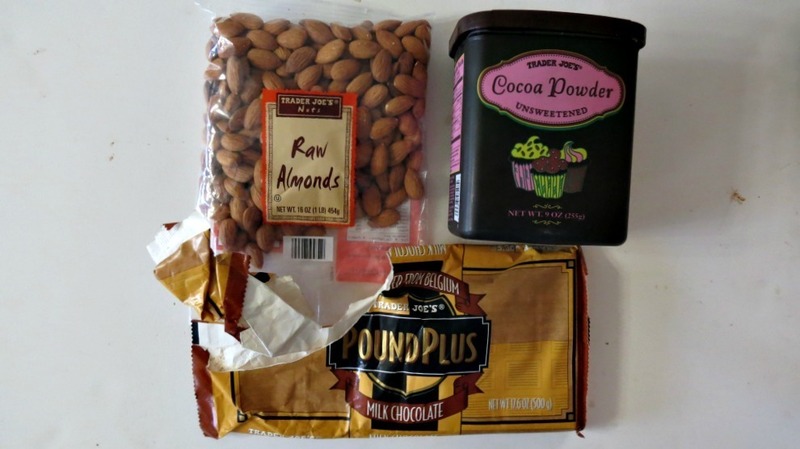 I was looking for a diy to replace my Aldi cocoa almond fix and since Trader Joe’s owns Aldi – I thought this might be close. It was! I tweaked a little with combining dark/milk chocolates and powdered sugar and it’s very good. Almost the same…and although I haven’t crunched the #s.. I’m guessing it’s cheaper than my $5something a bag. I tried the almonds both roasted and raw and prefer the raw. I also added a small amount of coarse sea salt and coconut palm sugar to counter the bitterness of the cocoa. In my opinion they were good but not quite as good as the Trader Joe’s almonds. Your combination sounds wonderful. I do have to admit and I love Trader Joe’s almonds. I just have a hard time finding them, so why not make your own. 🙂 Thank you for letting me know.